While ants on hibiscus plants aren't a cause for worry over your plants, these pests often spread quickly indoors, causing hard-to-handle appearances in kitchens and bathrooms. White-footed ants will not bite or sting or cause damage to your home, but like any pest, their presence is annoying. Familiarize yourself with control methods as well as preventive options. Identify your ants as white-footed ants for effective treatment and to avoid accidentally becoming the target of a biting or stinging pest. White-footed ants display dark brown to brown/black bodies that measure up to 1/8 inch in length, according to the University of Florida IFAS Extension. As the name suggests, these ant pests also display feet in a white to white-yellow color. In certain areas like Florida, the white-footed ant is a widespread pest. Originally named Technomyrmex albipes but amended to the accurate T. difficilis, this pest's first emergence in history was in 1861 in Indonesia. Spreading through different parts of the world such as Japan, Africa and Hawaii in 1911, the United States next saw this ant in Florida in 1986. The British West Indies experienced their first bout with white-footed ants in 2003, according to the University of Florida IFAS Extension. Their seemingly easy migration is due to human movement; ants take up residence during trave: for example, in cargo transport. If you notice white-footed ants on your hibiscus plants, check out your other plants for colonies, and look indoors as well. Ants prefer hibiscus as well as other host plants including, but not limited to, palms, fruit trees, gardenias and other sweet nectar plants, according to the University of Florida IFAS Extension. You'll often find them in your house because they seek out sweet food sources. A surefire sign that you have ants on your hibiscus plants is their presence as well as that of their eggs. These pests feed on the sweet sap of your hibiscus. Ants form nests in moist areas and near food, when possible. Look beneath your hibiscus leaves for adults and the presence of eggs. The prevalence of their large colonies means a substantial amount of eggs that hatch into larvae that resemble maggots, according to the University of Florida IFAS Extension. White-footed ant infestations are not hard to spot. In an attempt to prevent the migration of ants from your hibiscus plants into your house, keep hibiscus from touching walls, according to the University of Florida IFAS Extension. As ants seek out sweet food, keep sugary items sealed in your kitchen and bathrooms. 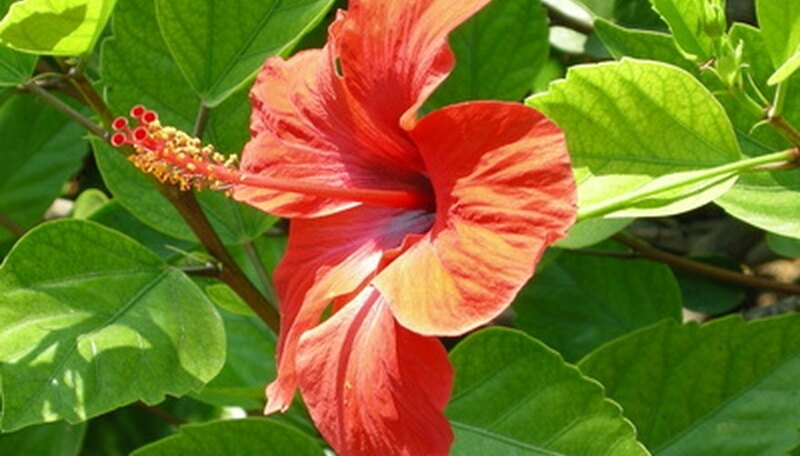 To control ant populations on hibiscus plants, contact a licensed professional for application of systemic insecticides that are absorbed by the hibiscus plants or residual insecticides that provide control for greater periods of time.